As those words spilled out, we both realized the weight that they carried. I need the light to write. I need Jesus to help and guide as I speak of His ways and share what He is stirring within. We all need the light of the Son to help us do what He has called us to do and to be who He wants us to be. I also need the light to right. I need the light of Jesus’ Word to right me. I can pluck the keys and string the words, but if I am just saying them and not doing them, I am offering a shallow cup to the thirsty. I have said it once and unfortunately I have to confess it again…I have neglected His Word. The very words that give life and are living waters to dried up souls have sunk down low on my priority list. I have been preoccupied with shining a bright light instead of letting the bright light shine through me as He is magnified (thank you Christine Cain for prompting this thought). I am grateful for His Word. This Word, Jesus, who became flesh and dwelt among us (see John 1:14). I am thankful that His Word can illuminate the dark places in hearts and help right us in the ways that we have strayed. Thank You for forming us to shine brightly for you. Thank You that our sins are forgiven because of what Jesus did on the cross. Forgive us for making light of Your Word instead of carrying it as a beacon of hope to a hurting world. Help us to forgive ourselves and take the next step as your truth lights our path (Psalm 119:105). Thank You that You are able to right us with the power of Your Words (Hebrews 4:12). Help us to seek Your face as we search the scriptures to know You better. We are thankful for you, the #TightlyWoundWoman Community. Thank you for your encouraging words, your courage in saying “me too” and your desire to grow as we find grace in the unraveling of life. We would love to hear from you. Consider answering one or more of the following in the comments section. How do you make the Word a priority in your life? What are some practical tips for getting God’s Word in your heart? What is your favorite scripture in the Bible? Why is this a beloved verse? Looking for some light to shine on these gray days? Check out these weekly link-ups and warm communities to uplift you. Wonderful post! Truth right here which spoke to my heart –> We so need the Light of His Word in our lives each day. Thank you for the reminder to make room each day for Him, especially in this busy month. Blessings! Thank you Susie. Blessings of peace as you faithfully follow Jesus each day, especially during this busy season. I LOVE THIS! My word this year has been LIGHT. God continues to show me so much about how we are who he created us to be when we are in the light. Likewise, your writing will flourish in the light. So true and lovely. Thanks for sharing this at #ThreeWordWednesday. Katie, it’s like you spoke my heart about the place to write. I think I told my husband just this week the very things you wrote in the first paragraph. And what a beautiful message I needed to hear! Beautiful prayer. This line…”Forgive us for making light of your Word instead of carrying it as a beacon of hope to a hurting world.” Now as I struggle with not enough of this earth’s light coming through my windows, I pray I will remember I have all the Light I need in the Word of God. Thanks for sharing, Katie. May your heart be full of His light today. My heart stopped as soon as I started to read your post. Seriously. As I type these words, I feel like I am in a mobile “office” of sorts. Our house is small and there is no way an office is even remotely possible. I guess my kitchen counter and little spot here on our cheerio-covered barnyard table is my best desk for the moment. Yet, I need light too. I need that space for my heart to wrap tightly around His Truth…His breath of fresh air. Thank you for this…it hit home in a very big way for me today! Still writing…one word at a time! Hi Bethany! Nice to see you here. Keep writing- it matters. :) You matter and He sees you right there at the table. Feast on His Word as you sit at His feet. Katie – thanks for stopping by I love this post – I am taking delivery of my new office in January and I want to use those words to remind me of what it is I actually need to write! Here is something I wrote just last week. It goes right along with what you are saying. Kim! Thank you for sharing your writing and not hiding it under a bushel. :) Loved the family photo of your lovely family by the way. 🙂 Thank you for your friendship. Your response is more appropriate than you realize. Usually my poetry and writing stays private. It goes unshared and is kept under a bushel. But, I am happy I posted it. I cam calling from a linkup and so thankful that I did. Your words are beautiful and fit me far better than I would like to admit. Kim’s poem also says so much to me today. I shall be pondering some and spending time with my LORD. Glad you headed over Linda and that you were blessed by Kim’s poem too. 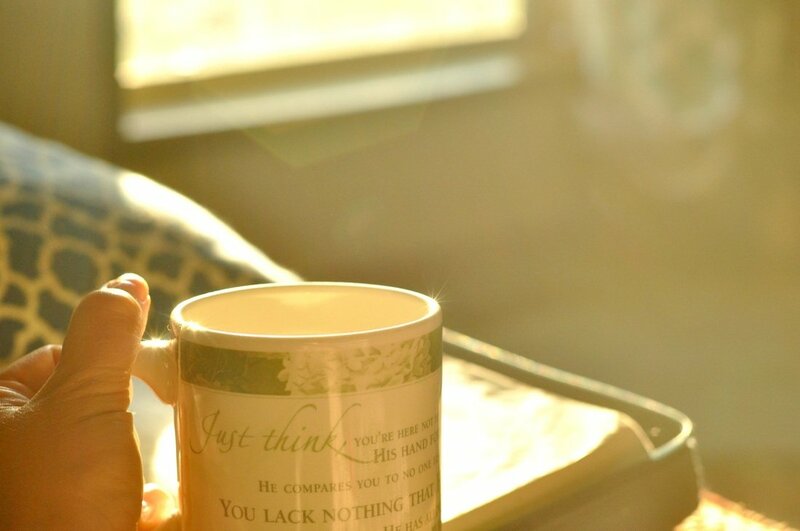 Enjoy His presence as you go about your day- He goes with you and rejoices over you. What a beautiful reminder the without the Light, our writing (and everything else) is in vain. I have the You Version Bible app on my phone, and I always read the verse of the day in several translations. I also spend time studying, journaling about and pondering the different chapters of the Bible. Right now, I’m on Acts. I’m leaning so much by reading it slowly, word by word (and nerd that I am, I color code all the nouns, verbs, references to the trinity). They say that seven days without prayer makes one weak–I’d argue that even one day without prayer does the same thing to me! Loved this Katie. Just today, I found myself asking the Lord, “Why is it so hard to truly walk in the Spirit, especially when it comes to writing and blogging. The desire to be read, valued, and known pops up as many times as I surrender and release every outcome to His hand. Drinking deeply from the real, living waters is what our souls need and crave. Ah yes friend the early rise before the house wakes up- that’s the sweet spot, isn’t it? But thankful for grace too as He is able to provide pockets of connection at other times too. 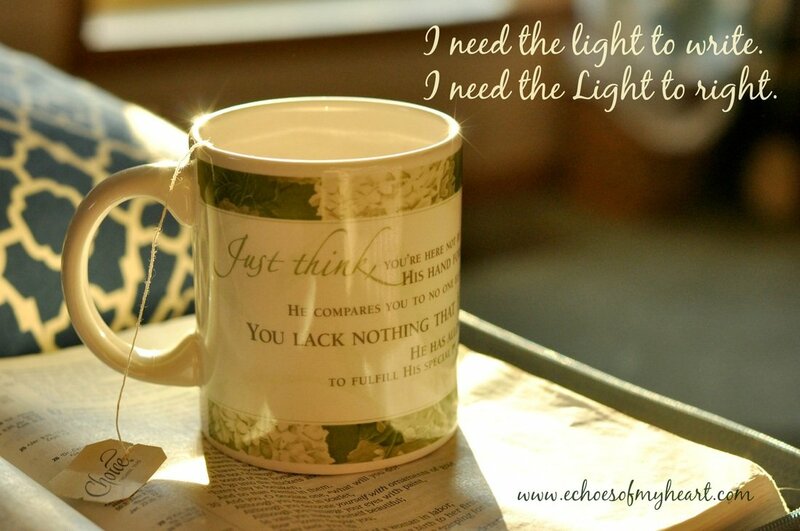 Trying to learn that He is always with us, not just in the quiet hour, but in the chaos of child-rearing too. :) Happy Thursday friend! I love those holy moments of inspiration! We so desperately need the Light for all of life. I loved your insight about how light makes right…I like using the audio portion of BibleGateway to listen to Psalm 27 lately as I’m trying to memorize it…I’ve realized when I memorize God’s Word then I can pull it up when I’m driving or washing dishes etc. Blessings and thanks for the book suggestion on Good Reads…I haven’t quite figured out how to navigate it yet.